The next to last but not the ending of the story in other words the penultimate moment. 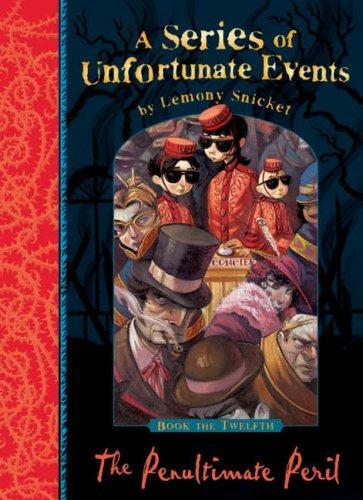 We left off in book eleven with the three Baudelaire's having just got into the taxi with Kit Snicket. They did no where they were going nor did they know anything about the women they were bar her name. Full of questions and hopeful they might finally get some answers the Baudelaire's waited. Kit explained to the children that the big meeting coming up on Thursday (and it being already Tuesday in the book) they had no time to spare, the children were needed. They were to go in disguise as three concierge's and begin observing people as flaneurs in the hotel Denouement. Flaneurs are people who observe the people around them and intrude when it is absolutely necessary. Kit tells them there is someone in the hotel who is using the initials J.S and impersonating her brother Jacques Snicket who of course we all know is dead, and that this person is after the sugar bowl. The Baudelaire's are told they will see many people they recognise both good and evil within the hotel and it is up to them to figure out who is on which side of the schism. Kit tell them she will be watching the skies and if for whatever reason it is not safe to continue the meeting they should send a signal up into the sky. So off the Baudelaire's go into the hotel where they run into almost everyone they have encountered over there many series of unfortunate events, like Kit said both good and evil. They are tasked to do things they don't believe they should be doing but in order to keep up the pretence of being concierge's they have to do them. Whilst working they overhear many things but cannot manage to put it all together at first and work out what is going on. 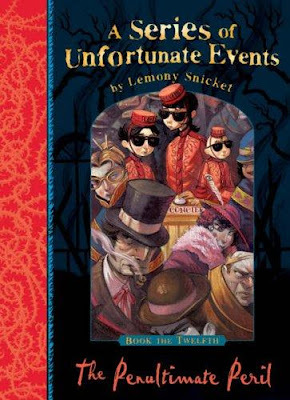 One night they are reunited with Justice Strauss and Jerome Squalor who inform the Baudelaire's that the whole reason for the meeting on Thursday is to hold a court hearing to try and clear the names of the three children and to take Count Olaf and his troupe into custody for all there crimes. Does all go to plan at the hearing? Do the Baudelaire's finally get their names cleared? Will Olaf get caught or will he escape yet again? Guess you better read the book to find out. I gave this book another 5* review on goodreads, i really enjoyed it i would of finished it in one night but my sleeping tablet kicked in and i fell asleep. Anyway a great book, was really glad to find out a little but more about the Quagmire triplets and hope the final book has the answers. Many of the mystery's were solved in this book but there are still loads of mystery's yet to be solved and with only one book left i hope we get the answers were looking for. This book and the last two have sort of left you questioning the three children, they are meant to be the good guys in the story but they themselves have done some terrible things. It can be argued they have no choice and i suppose you can ask yourself if your were in their situation what would you do? But i think this just adds to the characters of the children, it makes them much more three dimensional and seem much more real because an everyday normal person put in a bad situation like these children were could and infact very well probably would make the same bad decisions that the children themselves have made. So onto the final book i go, I'm a bit dubious and i have read some rather bad reviews were people are terribly disappointed saying this final book does not answers any of the mystery's left to solve and in fact leaves more questions than you began with however i shall read it anyway and of course i shall do my review afterwards.